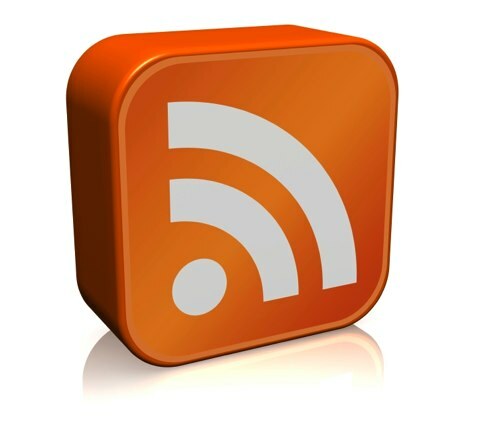 Now imagine that the network is the blogosphere where new blogs spring into existence every day. And as they do, these newly minted bloggers are aspiring to make money. They set up their blog, pick a unique topic, research Google ads and affiliate programs, and they start writing content. But they are in for big disappointment, because in order to make money from blogging, they'll need more than good, original content - they need traffic…You make money on a lot of traffic to a single popular site or the sum of smaller amounts of traffic to many less popular sites. It has to be a virtually infinite Long Tail aggregator. It has to be a good Long Tail filter (I mean here collaborative filtering such as recommendations, ratings, rankings, reviews, and votes). It has to have something to buy and sell. - Google aggregates the Long Tail of advertising and sells ads. As Anderson notes “Anybody can become a Google advertiser by buying a keyword in an automated auction process where the minimum bid is just $0.05 per click... Every time an ad is clicked on, the advertiser pays Google, and Google passes some of the money on to you”. And Google’s PageRank algorithm performs a wisdom-of-crowds search and assesses a page’s importance by the votes/links it receives. - Amazon aggregates the Long Tail of physical goods and uses different collaborative filtering tools such as product reviews, ratings, and recommendations. - eBay also aggregates the Long Tail of physical goods. eBay’s collaborative filtering model is basically based on ratings of the Long Tail of merchants who sell those goods. Blogging (i.e. a person or group writing about a subject(s) of interest), however, cannot make money even with the support of Google ads. Although a blog can be viewed as an aggregator of the Long Tail of knowledge and those who have it via comments and trackbacks, it cannot be seen as a virtually infinite Long Tail aggregator since the target audience is somehow limited. This is also true for popular blogs. Smart bloggers with huge influence (e.g. Stephen Downes) can have popular blogs and consequently get more in-links. They however still have a restricted number of readers interested in the topics subject of discussion in their blogs. Moreover, a blog does not include a powerful collaborative filtering technique. It rather filters the Web according to the narrow lens of a single blogger or a small group of bloggers in the case of a group blog. Furthermore, blogs do not sell products or services. Blogs mainly deal with knowledge (information and people). Information can only be shared and people can only be connected/networked. A short but nice article (.pdf) on “Improving workplace performance” by Jay Cross. Jay “looks at how employees and their organisations can take advantage of the web 2.0 toolset and philosophy to support learning and improve performance in the workplace”. He writes: ” Web 2.0 offers unprecedented opportunity for corporate learning, innovation, customer service, growth and profitability”. Josie Fraser and James Farmer announced the Edublog Awards 2007 Finalists. 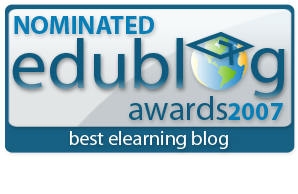 It’s an honor to be nominated as a finalist for “Best elearning / corporate education blog” amongst excellent bloggers such as Clive Shepherd, Susan Smith Nash, Tony Karrer, and Wendy Wickham. Many thanks for everyone who has nominated my blog under this category. If you like my blog and would like to vote for it you can do this here. I would be very grateful for that! I finished reading “The Long Tail” by Chris Anderson. I really enjoyed reading this book, though I was familiar with the Long Tail concept from previous readings. Increasingly, the mass market is turning into a mass of niches…Our culture and economy are increasingly shifting away from a focus on a relatively small number of hits (mainstream products and markets) at the head of the demand curve, and moving toward a huge number of niches in the tail. He then explains these opportunities in detail in chapter 5 (The new producers), chapter 6 (The new markets), and chapter 7 (The new tastemakers) which are in my opinion the most important chapters of this book. Somehow the following chapters repeat the same information though they include interesting real life examples. The first force is democratizing the tools of production. The distinction between "professional" producers and "amateurs" has blurred, as the tools of production and creativity has become cheap and ubiquitous. The second force is cutting the costs of consumption by democratizing distribution. “Aggregators” are a manifestation of this second force. 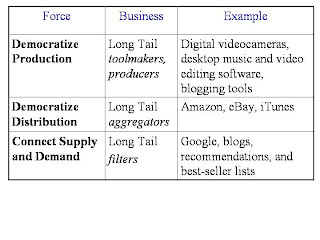 Anderson gives several examples of Long Tail "aggregators". Google aggregates the Long Tail of advertising, Bloglines aggregate the Long Tail of online content (blogs), Wikipedia is an aggregator of the Long Tail of knowledge and those who have it. The third force is connecting supply and demand, introducing consumers to these new and newly available goods and driving demand down the tail. Anderson stresses the need for “filters” that should help us find quality in the Long Tail. As he puts it “Amplified word of mouth is the manifestation of the third force of the Long Tail: tapping consumer sentiment to connect supply to demand. The first force, democratizing production, populates the Tail. The second force, democratizing distribution, makes it all available. But those two are not enough. It is not until this third force, which helps people find what they want in this new superabundance of variety, kicks in that the potential of the Long Tail marketplace is truly unleashed”. 2. Help me find it. Rule 3: One distribution method doesn't fit all. Rule 4: One product doesn't fit all. Rule 5: One price doesn't fit all. I highly recommend this book. Chapters 5, 6, and 7 are must read for everyone who wants to get a big picture of the three forces of the Long Tail. Ray Sims wrote a series of great posts on „The convergence of L&D and KM“ (Part1, Part2, Part 3, Part 4). Ray pointed to my post related to the same “Learning and Knowledge Management are 2 sides of the same coin” where I argued that learning and KM solutions have to fuse; that we should speak about union and fusion of the two fields rather than intersection or complementary relationship between them and that the two fields are increasingly similar in terms of input, outcome, processes, activities, components, tools, concepts, and terminologies. Ray and I agreed that, though we are not there yet, we are along the convergence path now and that more movement in this direction is suggested. I would like here to add that this convergence will NOT happen if we keep dealing with “traditional” learning and KM models. In earlier posts, I pointed to some deficiencies in current learning and KM approaches and stressed that a radical revision of traditional learning and KM models is required. In the modern knowledge-intensive era, the one-size-fits-all, centralized, static, top-down, and knowledge-push models of traditional learning and KM initiatives need to be replaced with a more social, personalized, open, dynamic, emergent, and knowledge-pull model for learning and KM. In my PhD project “Social Media for Knowledge Management and Technology Enhanced Learning”, I’m trying to study how social media can achieve the convergence between learning and KM and bridge the currently existing gap between the two domains. I’m currently working on a social media driven approach to learning and KM that should have the potential to overcome the deficiencies of previous learning and KM models. This approach should reflect the nature of learning and knowledge as being social, personal, flexible, dynamic, distributed, ubiquitous, and complex. A chart from the LibraryHouse blog showing acquisitions by Google, Microsoft, and Yahoo from July 2006 to June 2007. Lucas Holland has produced four videos to introduce Ruby. A nice slideset by Peter Marklund. The slides are from a five day "Rails 101" course and include an excellent introduction to different Rails topics (installation, Ruby, migrations, ActiveRecord, forms, views, Rails 2.0, deployment, etc). The slides can be downloaded as a PDF file here. They are also available at Slideshare. A nice video by Michael Wesch in collaboration with 200 students at Kansas State University showing important characteristics of learners today. An excellent video from Google's first CampFire One event showing the wide adoption of OpenSocial initiative by most of the important social networking sites such as MySpace, Friendster, hi5, LinkedIn, Ning, orkut, Salesforce.com, Tianji, Viadeo, and XING. a set of common APIs that make it easy to create and host social applications on the web. OpenSocial allows developers to write an application once that will run anywhere that supports the OpenSocial APIs. Last Wednesday I attended the "Aachen Technology Entrepreneurship Conference" ATEC 2007 held in Schloss Rahe, Aachen and hosted by the RWTH chair for Business Administration and Sciences for Engineers and Scientists (WIN) and the RWTH Centre for Entrepreneurship. The main goal of the conference was to bridge the gap between research and business by discussing how new trends in technology can be applied in both ressearch and specific industries. The ATEC program included a full day of interesting entrepreneurial speeches. I much enjoyed the speech by Dr. Bert Twaalfhoven on "Lessons from failures". In his speech, Dr. Twaalfhoven who started over 54 companies in 11 countries was mainly talking about learning from failures. Many of his companies were successful, however, 17 ventures failed. It was very interesting to listen to him talking about what he has learned over 40 years as a serial entrepreneur from his failures rather than successes. According to him, the main reasons for failure come from the different cultures. Another very interesting speech was given by Dr. Cornelius Boersch. Dr. Boersch who was elected entrepreneur of the year in Germany in 2000 and is currently the main shareholder of Mountain Partners AG talked about his experiences as an entrepreneur and business angel. According to him, to be a successful entrepreneur, just apply the KISS principle "Keep it simple, stupid, and short". He has also given critical success factors for young entrepreneurs. In late afternoon, I attended a workshop on "Pricing" where basic theoretical methods for price building have been introduced and different examples from practice have been presented. RWTH Aachen University has recently been approved within the Excellence Initiative of the German federal and state governments as an elite university and now belongs to the top universities in Germany. Over the last couple of days I attended a CUELC seminar at Cairo University, Egypt. It was indeed a very nice event. Undergraduate and postgraduate students from Aachen University, INR Evry, and Cairo University met together to discuss their TEL experience. The fruitful discussions revealed that the cultural background has a great impact on TEL. This will be documented in reports that the students from the different institutions will be preparing over the next days. These reports will also build the basis for the upcoming project deliverable. It was a also very nice to see again Prof. Samir Shaheen, the Dean of the Faculty of Engineering, Dr. Nevine Darwish, the head of the computer engineering department, and Dr. Magda Fayek, the associate professor at the same department. We discussed the progress of the CUELC project as well as the current state and future of TEL in North Africa and the Middle East. We really enjoyed the 3 days we´ve spent there. Besides long discussion sessions and workshops, we visited several great places and monuments like AlJiza Pyramids, Egyptian Museum, Al Hussain Mosque, Khan El Khalili, and Al Azhar Park. We enjoyed the time there with our friendly and professional guide Fayez who provided us with a great overiew of the cultural and natural heritage of different Cairo locations and Wael the awesome chap who took us on a car tour to experiment the nightlife in Cairo. It was amazing how he knows every single place in Cairo and how to get there in a very short time.